With my Takamine right after I got it. I've always wanted to play the guitar. Christmas 2007 Jay bought me my first guitar, a Takamine GS330S which is an accoustic with solid cedar top. It has a beautiful warm tone and is easy to play. My second guitar is a Squire by Fender electric stratocaster which I bought used. It's been modified to have a humbucker, and was so cheap at Guitar Center that my friend Chris said I had to have it, so I bought it. I eventually sold the Fender amp that was with it and bought a Line 6 Spider. The stratocaster is a wonderful design, like the race car of electric guitars, and feels good to hold and play with its slim profile and carved body. The stratocaster was a real innovative design in 1955 and it holds its own even today. If you look closely, you can see my Firebird guitar strap. My third guitar (they are almost as addicting as Borzoi!) is my pride and joy, an American built Martin D16GT, a solid wood acoustic guitar. It has a solid spruce top and solid mahogany back and sides. This guitar looks like almost any other spruce top dreadnought guitar and is on the plainer side, but of course has that typical Martin sound and flawless craftsmanship. It's been by far my most expensive guitar, but worth every penny! My 4th guitar is a present for Christmas 2009 to myself because I fell in love with it. 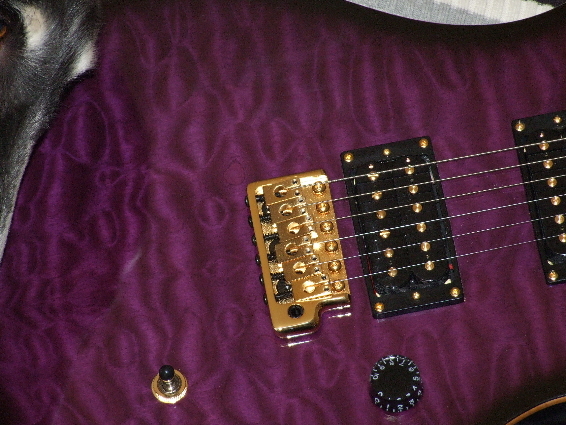 It is a PRS SE Paul Allender purple burst with dual humbuckers. It has a wide thin neck that feels great in my hands. It has a neck-through construction, double humbuckers, and maple/mahogany woods. This guitar is real eye candy with its mouth-watering curly maple top and bats in flight neck inlays. I am really looking forward to playing this one. It also was a Guitar Pick from Guitar Player magazine, so I carefully researched it before I (totally) lost my head. And hey. It was ON SALE. "Superb workmanship. Versatile tones. 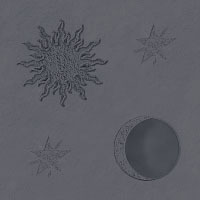 Excellent hard-rock/metal yowl. Edgy cosmetics. "...This wraith is downright flawless. This guitar screams. Looks aside, this is a versatile, and fun - guitar that's dripping with vibe." To the left is guitar number seven, a very special guitar indeed. This is a Schecter Diamond series Damien 6 FR. This handsome guitar has dual EMG soapbar pickups and a Floyd Rose locking tremolo. It shares with my PRS bats in flight on the fretboard. It has Grover tuners and a matte black finish. Though it is stylishly sinister and an incredibly awesome guitar with its hot pickups and other embellishments, what makes this good-looking axe so desirable is that is was hand signed by one of my favorite groups, Papa Roach. 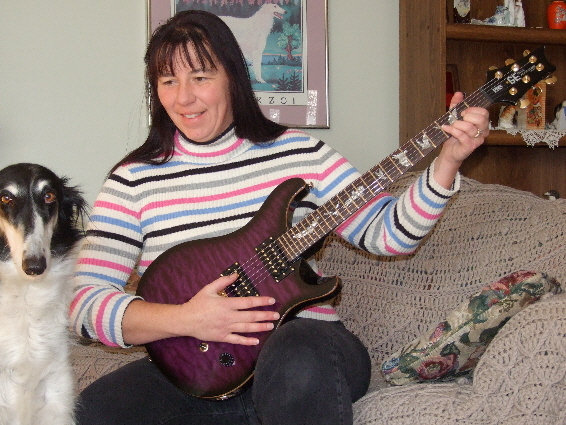 This guitar was given away at a contest last fall (a contest I wanted to win and didn't!). It eventually ended up in a pawnshop where Natalya and I saw it. I knew immediately what this guitar's history was and bought it (talking the store down, of course, was part of the fun). I never thought it would come for me, but it did. Guitar #8 is a 12 string. As a general rule, 12 strings have frightened me because they have...well...so many strings! This is a challenge when tuning them. This guitar, bought used at Guitar Center, was a heck of a buy and in like new condition. It is an Art & Lutherie, made in Canada out of 95% Canadian wood. Although not the Taylor 12 string I secrety lust after, it was a fraction of the price and plays beautifully. Finally, I can play my favorite Pink Floyd song, "Wish You Were Here", with the proper number of strings. What can I say. I need to stay away from Guitar Center. Playing the guitar is interesting and challenging and I will no doubt never master it. I played the piano as a youngster and can read music, but the guitar is way different! I really enjoy my two acoustics and am learning to play a range of music from Bach to The Clash :-) Now I am starting to play a little more on the electrics, because, hey, Megadeth doesn't sound so hard-rock ballistic on an acoustic. 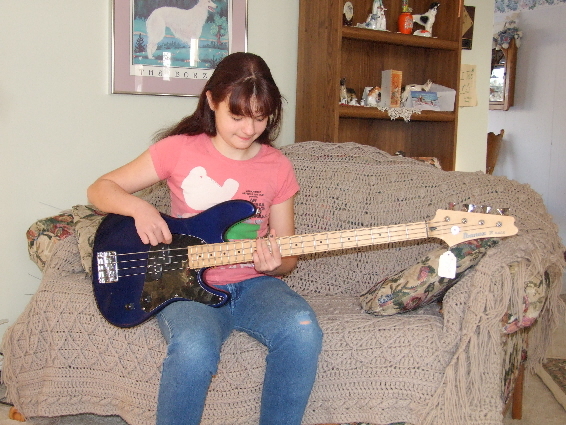 Naturally, the fam is getting involved, and my daughter the bass player is shown with her used Ibanez p bass. I wanted to get her a shorter scale guitar, but she wanted a big one. She too has a Spider Amp. I still play Guitar Hero on a regular basis ( we have three GH guitars, HA HA) - but most of the time I relax with my "real" guitars. They are fun to look at and fiddle with. Keep coming back for updates!